"It's shocking Google never created this software on its own." 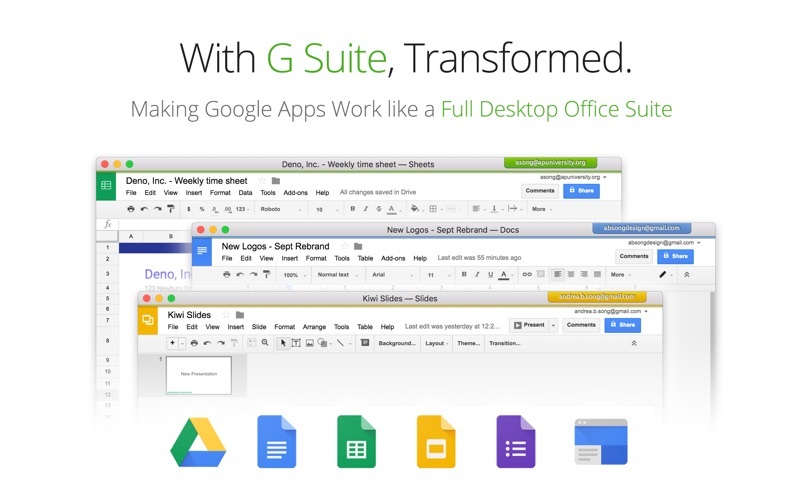 -- Inc.
Kiwi for Gmail 2.0 integrates all of G Suite (formerly Google Apps) with Gmail as the centerpiece. 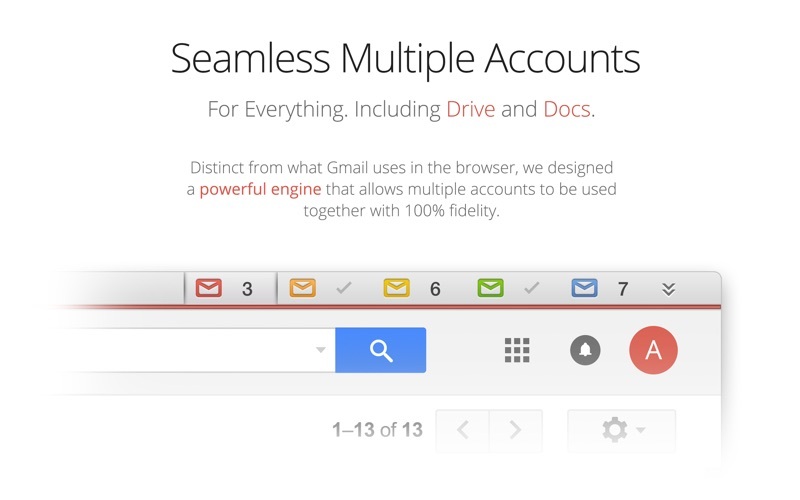 We turn Gmail and the rest of G Suite into a full-powered desktop client that takes everything you know and love about Gmail and apps such as Docs, Sheets and Slides, and add great new features – including the ability to simplify your life by seamlessly managing multiple Gmail accounts. Finally a solution for office productivity that competes with Microsoft Office 365. Kiwi for Gmail 2.0 with G Suite revolutionizes Gmail by transforming not only the functionality and interface of Gmail itself, but also how it works with Google Apps. 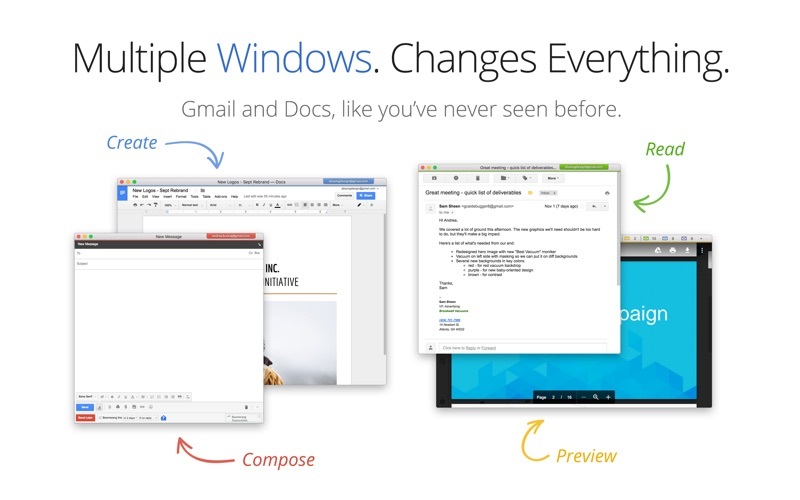 By providing multiple windows, desktop integration, and a simple, intuitive interface that allows you to quickly access each application, open new documents, and get back to recent documents with a single click, Kiwi for Gmail 2.0 now gives you all the great functionality of G Suite apps in a better way. 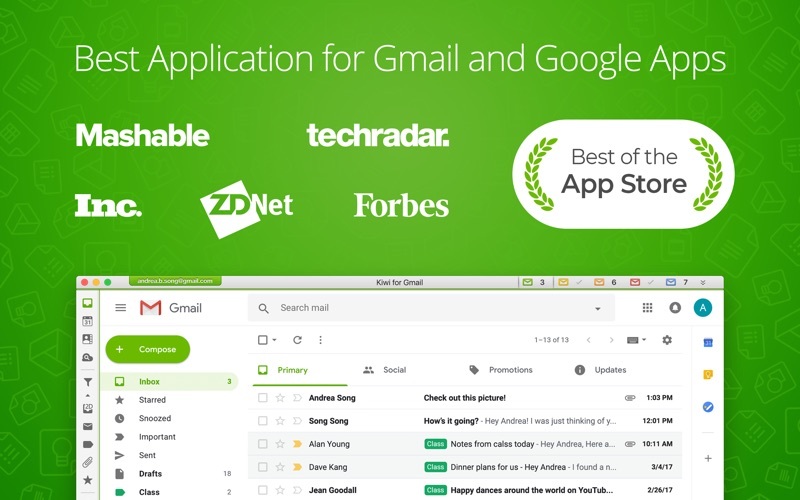 One of the most anticipated apps on Kickstarter in 2015 and two years in the making, Kiwi for Gmail delivers a sophisticated app that thoroughly integrates Gmail into your desktop experience in ways that simply aren’t possible in the browser. To do this, we rebuilt how Gmail functions on the desktop from the ground up to make it faster, easier to use, and more reliable. Get started today and discover a whole new way to use Gmail and G Suite. • Huge attachments - Send giant files using Google Drive, which is now so quick to do, it's even simpler than Dropbox. • Powerful Keyboard Shortcuts - let you get to your email in a second. • Important-Only Notifications - a desktop email first; use this optional feature and filter the noise right out of your email effortlessly. • The Zen Switch(tm) - shut off all email notifications so you can focus, without shutting out the whole world. • NOTE: Kiwi for Gmail does not have *offline support*, which is incompatible with serving all Gmail's features. • NOTE: Kiwi for Gmail does not support Google's Inbox. • Gmail as a Polished Desktop Experience - Windows for new messages, the calendar, Google Drive; Attach photos, documents, or whatever you want by just dragging them on; An inbox that works like a desktop application and not a strange menubar dropdown hybrid -- we've thought of everything. • Gmail as your Default Email Client - It really works. Replace Mail and Outlook completely with Kiwi for Gmail - click an email in Contacts or the browser and it'll open one of our beautiful new email windows. • Dock icon, Menubar dropdown, and full Inbox window. • Gorgeous, simple New Message windows - Vastly improved over the browser. 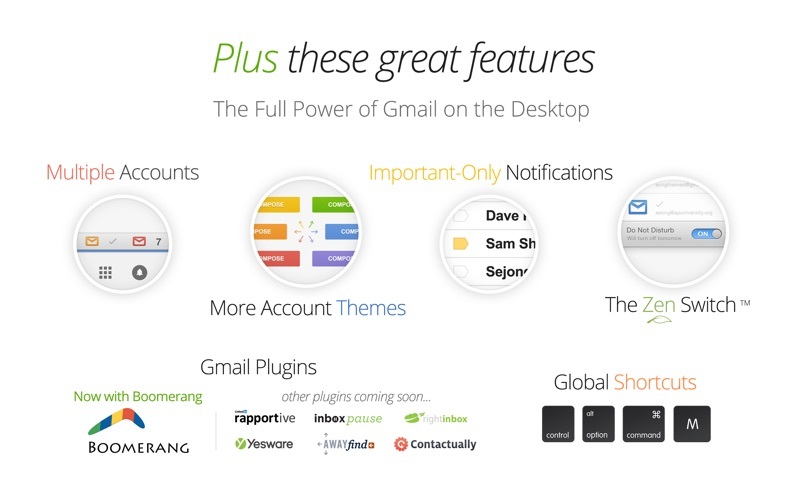 • More Gmail plugins - We'll be integrating various third-party plugins in coming updates. Requires macOS 10.10 or newer.